Financial statistics are valuable because they can guide us towards financial stability. Your finances need to be sorted out so that you can live a stress-free life and be able to enjoy things more. After ensuring your day-to-day finances are sorted out, you can then find out how to start saving and improving your credit score. Finding ways to save more money can be difficult at first, but it essentially becomes a habit, and the longer you do it the easier it gets. If you’re having some trouble getting started perhaps these shocking personal finance statistics will motivate you. Click here for more information about how credit score is calculated and some amazing tips on how you can get a personal loan even with bad credit! Financial statistics show that if you’re going to start saving for your retirement once you’re 45, you’re going to have to save FOUR times your annual salary, as opposed to only 25% in your 20s. Saving at such a young age can be difficult. When you’re in your 20s, you’re not thinking about retirement, you’re thinking about a car, a house, and getting married. And, let’s be honest, most money-saving tips are not really fun and pleasurable. However, you shouldn’t be too preoccupied with your current goals while neglecting future ones. Yes, it’s a load to save money while your career is just starting and you’re probably in debt thanks to student loans, but it won’t be any easier at 45. Having to put away $200 each month at 25 years old is much easier than putting away more than $3,000 each month at 45. Try starting to save for retirement early especially if your financial situation is stable and you don’t have much debt to cover. For some great ways to pay off your student loans faster in order to start saving for retirement sooner, check out this article. Making monetary decisions and doing research to explore all options can be quite scary. We don’t like to think about money, we just want it to be available so we can spend it whenever we want without having to give it a second thought. Looking into saving and investing statistics in itself is even scarier because there’s always the possibility of losing your money and not knowing whether the opportunity presented to you is financially sound. That’s why it seems that 51% of Americans postpone financial decisions. This statistic indicates that most Americans are unequipped to make decisions about their finances or at least don’t feel confident enough when making them. Delaying these decisions can have a detrimental effect on your finances. If you’re required to make a decision then something probably came up and postponing will not help in any way. 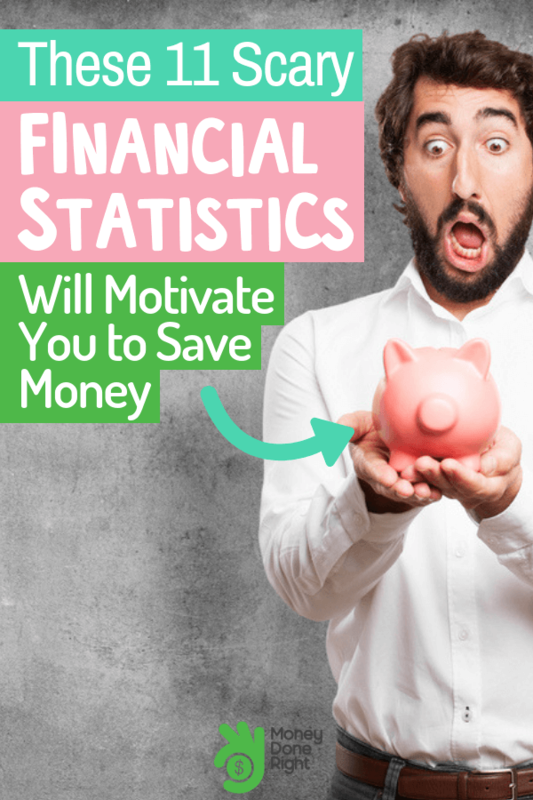 Perhaps one solution is looking into your personal saving statistics and finding ways to improve your personal savings by saving money every month. If your savings account is at least adequate and can get you through a rough patch you’ll feel more secure making decisions knowing they won’t hurt you too much since you have something to fall back on. In fact, having stable finances might allow you to take more investment risks which could lead to profits. If stock investing sounds like your cup of tea, check out these very helpful investment apps. The median income of an American household is under $60,000 per year. According to that stat, those who make $100,000 per year should have it made. If you’re making almost 100% more than the average American household then money shouldn’t be an issue at all. Surprisingly, that’s not the case. Financial statistics show that most Americans making about $100,000 per year are still living paycheck to paycheck. Truth is that financial intelligence has nothing to do with how much you make. You could be the best at what you do so people are obviously paying you a lot of money to do it, but you have no clue how to handle all that money. That’s why saving is so essential. If you put away a fraction of your salary each month you’ll guarantee having it at the time of need and not spend it the wrong way. Living paycheck to paycheck also means not saving money for retirement. It would be a real shame to make so much money and have none of it to aid you when you retire. Click here if you want to learn how to invest your money properly! We bet you’re reading this and thinking that there’s no way people carry mortgage debts into their retirement and that you’ll definitely settle your debt before you retire. Here’s the shocking part: you’re wrong. More than 21% of Americans 75 years or older carry their mortgage debt into retirement. One of every 5 Americans over 60 years old still has to pay for his or her mortgage. Retirement should be a time to enjoy life and spend your savings traveling and being comfortable. Still having debt during that time of your life could drastically affect your lifestyle. If you’re truly retired you’ll have no source of additional income to pay off that debt. You’re going to have two choices: either to live frugally to save every month to be able to pay your mortgage, or go back to work. Either way, we’re sure that’s not the way you pictured retirement. If you’re looking for ways to make extra money every month, check out this amazing list of side hustles. Do you realize how much $3.1 trillion is? Because that’s how much is spent on healthcare per year. It’s not your concern how much an entire nation spends on healthcare, food, or even war. However, you should be concerned about how expensive getting medical help is. You probably already know about this issue because it’s been brought up several times by politicians over the past couple of years. If you’re not into politics, there has been no shortage of movies about people having to become criminals in order to pay for their loved ones’ medical bills. Either way, you have to make sure your employer has you registered for a healthcare plan and that it covers all the essentials and potential emergencies. If your workplace doesn’t do that then you should look to renegotiate your contract, find a new job, or start saving on your own. However, saving for healthcare on your own is the worst option. Between saving for retirement, paying bills, and getting the essentials, your personal finance statistics are already stretched. Sure, you could save a small amount as a supplement in case any minor issues arise with your healthcare insurance, but the most important thing is to actually register yourself and your family for insurance or a healthcare plan. Looking for affordable insurance but with good coverage? Check out this list of cheap insurance policies and why it’s worth giving them a try. The monthly average car payment in America is $480. That’s a lot, especially for those working minimum wage or anyone making less than $3,000/month. Having to pay $500 each month is crazy and takes away a huge portion of your monthly salary. You need to save as much money as possible before you make the decision and go out and buy a car. Having money to start with will allow you to pay more upfront and limit the monthly payment. At least you’ll be able to pay the monthly payment out of your savings account rather than from your salary. Until you feel comfortable enough with your savings, we recommend finding other ways of getting around. Alternatively, you could start your life with a modest car that won’t cost too much but will still get you around fine. A great way to save on gas money would be to carpool with your co-workers. Of course you could forget about getting a car altogether and use public transportation, especially if you’re living in a city where that option is readily available. Click here to give a try to our ridiculously simple money saving challenge! A Gallup poll showed that only one in every three Americans prepares a detailed monthly budget for their household. That means that two thirds of all Americans don’t know how to budget or simply don’t do it for whatever reason. Budgeting is an essential part of saving, living comfortably, and learning what you need and don’t need. By restricting yourself to a budget for a while you’ll ultimately be able to save enough to get yourself something expensive that you’ve always wanted and live a financially stable retirement. To make a budget you have to determine how much you’re willing to spend from your salary and how much you’d like to save. For example, if you make $3,000 per month you could decide to save $300, so you have $2,700 to cover your expenses. Sometimes it helps to allocate a couple hundred dollars every now and then to spoil yourself with a game console or a new phone. By setting a budget you’ll be able to detect any deficits and naturally you’ll start to look up ways on how to cover that deficit, which is quite healthy for your own personal economy. What are you waiting for? Click here for some creative tips on creating a budget! We have two scary statistics for you here. The first is that less than 50% of Americans have enough saved up to get them through a rainy day. The second is that most Americans don’t have enough savings to cover an emergency expense of $1,000. This is something that should concern you and concern every Americans out there because rainy days to happen. Your car might need repairs or you might have to pay a medical bill or anything out of a large number of things. If anything, these stats show how stretched out Americans’ budgets are each month. Money statistics can often be misleading or exaggerated, but these show a scary truth. Do whatever you can to ensure having some wiggle room in case of an emergency. Unfortunately, bad things that we never plan for do happen. Luckily they don’t occur every month of the year, but you’re likely to face one every 2-3 months so try to be prepared. For more advice on how to save money by going green, check out these 25 easy tips! We’ve already established how many people carry their mortgage debt into retirement, but they’re also carrying more student loans! When we graduate we assume we’ll pay off our student loans within 5-10 years and be done with them once and for all. It seems, however, that the number of Americans over 60 who still have student loans has quadrupled! People who came into this thinking retirement would be a fun time probably aren’t enjoying themselves as much now. Not only do we carry the risk of having a mortgage into our retirement, but student loans too. We all think our student loans are the monsters we have to deal with while we’re in our 20s and maybe 30s, but having to deal with them until we’re over 60 is a very harsh truth. The more you put off these loans the worse it gets too because interest rates rise over the years and most of the time your wage doesn’t grow at the same pace. Never put off paying your student loans because you’re too preoccupied buying a house and a nice car. From the moment you graduate, one of your primary goals should be paying them off bit by bit until they’re completely gone and you escape their burden. Here are 11 of our best and most creative tips on how to pay off your student loans faster. Only a quarter of millennials know what they’re doing financially, which is a stunning statistic in itself. What makes it worse is that 69% of them think the opposite, financial statistics suggest. Overestimating their capabilities to make financial decisions and budget their monthly expenses could lead to millennials making fatal mistakes. It’s always better to know that you DON’T know. That way you know your limits and think things over before deciding to do them. Alternatively, being ignorant of your lack of knowledge will result in making wrong decisions repeatedly and with confidence, which is something millennials can’t afford to do in this economy. There’s also the issue of only 25% of them knowing their finances. It’s certainly not their fault because this is the kind of thing they should learn at school and from their parents. The only other way of learning is through trial and error but no one wants to keep making financial mistakes and losing money. Click here for a comprehensive money guide to earning online for millennials! According to financial statistics, one third of Americans pay the minimum due on their credit cards each month. Ultimately each household ends up facing an additional average of $1,300 per year due to accumulating interest. Avoid this by not spending over your needs. By buying too many things that aren’t essential you’re not only spending valuable money, but you’re also spending extra cash paying for all that interest. Plus, you won’t be able to enjoy this for long since your credit card score will start to drop. Pay in cash whenever you can and separate the things that are worth buying from those that’ll hurt your finances. Running out of ideas on how to save more money? Check out our detailed money saving guide! It’s neither easy nor fun to save money so it’s understandable why so many people choose not to. Not everything in life is fun though and sometimes you need to be prepared for rainy days and for a happy and lazy retirement. Keep your personal finances in check and do your best to sort any irregularities and correct deficits. How are you faring when it comes to saving money? Are you sure you have enough set aside to handle an emergency? Share your thoughts with us in a comment below!